Ceiling fan motors are available in two varieties: AC and DC. (No, not the rock band!) What’s the difference between the two types of ceiling fan motor? Which one is a better fit for you? First, let’s learn about fan motors. AC means alternating current and DC means direct current. The difference between the two is in how the motors handle the electrical current they receive from the wiring in your ceiling. AC motors use the supplied power from your electrical wiring directly, regulating speeds by controlling the frequency of the current. Let's look at the advantages of both ceiling fan motor types now. AC ceiling fans are a smart choice for budget-conscious shoppers while DC ceiling fans are a smart choice for people focused on efficiency and energy savings. (Lights Online brands Monte Carlo and Kichler say their DC fans use 70 percent less energy than their AC varieties!) Fanimation, Craftmade, Quorum, Savoy House, Hunter and Casablanca also offer DC fans. 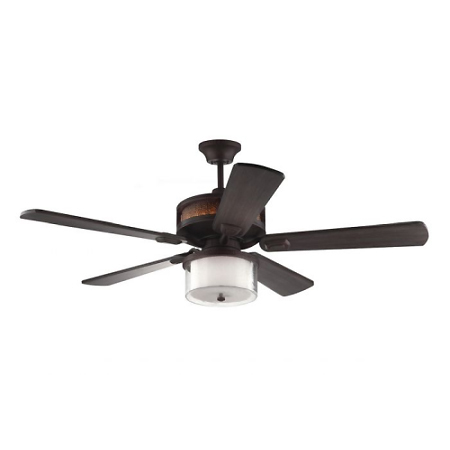 Plus, the smaller size of DC motors means that ceiling fan designers can create more compact and unique looks. If you're interested in out-of-the-box ceiling fan designs, those will likely use DC motors. While AC ceiling fans use more energy than their DC counterparts, neither type uses an enormous amount of energy, especially compared to how much energy an HVAC system uses. Still not sure what type of ceiling fan motor is right for you? Let’s talk dollars and cents. Ceiling fans have a Ceiling Fan Energy Guide with 3 numbers: airflow, electricity use and airflow efficiency. Airflow is measured in cubic feet per minute (cfm). The higher the airflow number, the more air is moving. Divide the airflow by the electricity use to get the airflow efficiency. The higher the airflow efficiency, the more efficient the fan. Let’s compare two similar ceiling fans, one with an AC motor and one with a DC motor. Minimalist is the winner in efficiency thanks to its smaller electricity use from the more efficient DC motor. The two fans are fairly evenly matched when it comes to airflow. The Artizan does have a more traditional style, which might fit your personal taste. Notice how the Minimalist has a slimmer look because it doesn’t need housing for a large motor. Remember: Both of these fans have integrated light sources, but the energy used by those lights is not included in the energy guide’s measurement. Artizan has an integrated 10-watt LED uplight at the motor housing and a 17-watt LED downlight that is sold separately. Minimalist has an integrated 16-watt downlight. If you add those wattages to the fans’ electricity use and then recalculate the airflow efficiency, Minimalist is still the winner. Let’s use this Energy Use Calculator to figure out the cost of using Artizan and the cost of using Minimalist. We’re using the calculator’s default settings of 3 hours a day at 10 cents per kilowatt hour, but you can change those settings to fit your usage and local energy cost. Artizan costs 68 cents per month or $8.21 per year. Minimalist costs 25 cents per month or $2.96 per year. Because people tend to keep ceiling fans for about 10 years, let’s multiply those energy costs by 10. Artizan, without the lights on, costs $82.10 to operate over 10 years. Minimalist, without the light on, costs $29.60 to operate over 10 years. You can see how a DC motor gives you energy savings over time! But let’s not forget the upfront cost to purchase these fans. Our price for Artizan is $579 and our price for Minimalist is $848. (Note: These prices are accurate as of this writing in June 2018, but subject to change in the future.) Adding the 10-year energy costs shown above, Artizan is $661.10 total and Minimalist is $877.60 total. 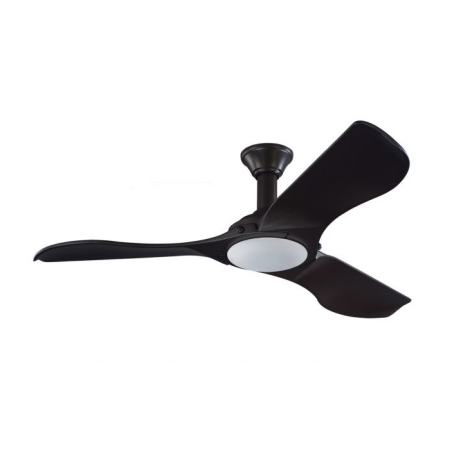 If the upfront cost is the single most important factor for you in buying a ceiling fan, Artizan might be your winner. If you want something more contemporary, or you’re fine with a higher upfront cost, Minimalist could be your perfect match. Here's one more important thing to keep in mind about ceiling fans that use DC motors. These fans often come with "learning" remote controls that pair with the fan. When you are pairing the remote to the fan, it is important to let the whole pairing process complete without interruption. Should your fan begin to spin, blink its light or stop spinning, don't touch it or try to stop it! The remote is still learning everything it needs to know to operate the fan. Let it be for at least 6 minutes and don't touch any buttons during that time. It will be well worth it in the end! In the end, the AC vs. DC ceiling fan decision is yours to make and can be based on many factors. The information above will help you make a well-informed decision. If you need further advice, feel free to contact us, live chat with us, call us at 1-866-688-3562 or talk to us on Facebook and Twitter. Sign up for our email newsletter today and score an additional discount!